Patient malnutrition in hospitals is common and impedes recovery. Part of the problem is that hospitals are organised around diagnosis and treatment, not for good nutrition. 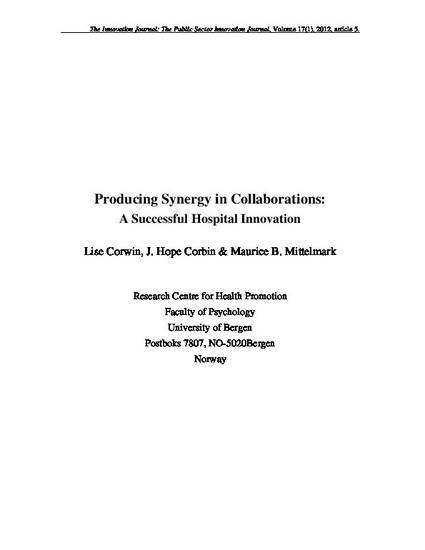 This paper describes a Norwegian hospital’s nutrition innovation that enhanced collaboration across and within the hospital hierarchy. The Bergen Model of Collaborative Functioning was the analysis framework for the study reported here. Success factors included having a clear mission, a sound implementation plan, leader commitment, trust and coordination, committed partners, clear structure, rules and roles, face-to-face communication, celebrating accomplishments underway, and utilising the surrounding context to give the innovation visibility and publicity. Article posted with permission from Eleanor Glor.